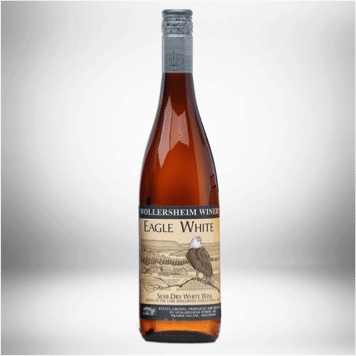 Taste Eagle White and watch eagles soaring over the vineyard! During the heart of winter, the Sauk Prairie area near Wollersheim Winery becomes a crucial place for nesting bald eagles that flock here to fish the open waters along the dam of the Wisconsin River. But the wintering eagles need more than open water to survive – the valleys and bluffs where they roost must be protected. For this reason, Wollersheim Winery has dedicated its efforts to the preservation of the eagles by donating a portion of the sales from each bottle of Eagle White to care for local habitats for bald eagles. Eagle White is a semi-dry white with soft hints of pear and apricots. Made from Wisconsin-grown St. Pepin and La Crosse grapes, and is a multiple award winner at the Wisconsin State Fair Professional Wine Competition. Serve with appetizers, pizza and eagle’s favorite food: fish!